The origins of French Cut Diamonds can be traced back to the 14th-Century. The origin of the name isn’t completely clear, but the most common assumption rests on the fact that the cut was more popular in France than other nations at a certain point of History. French Cut Diamonds are a natural evolution of the Table Cut, which is considered the very first examples of faceted Diamonds. Table Cuts have been recorded from as early as the 14th-Century in Italy and were highly prized throughout Europe until the mid-17th Century. 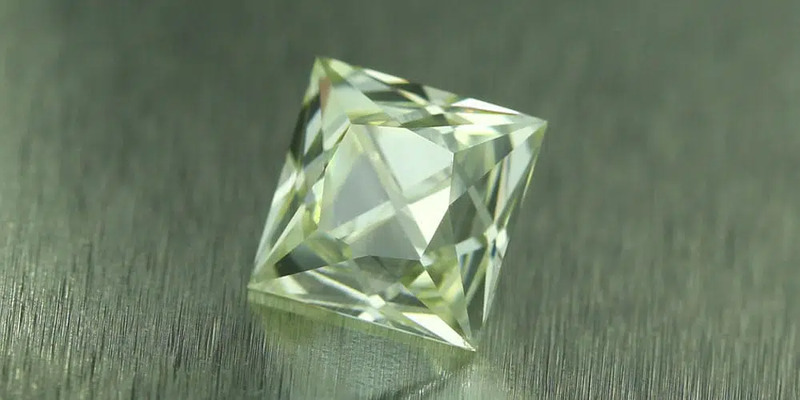 First came the Point Cut, which merely “cleaned up” the natural octahedral shape of the Diamond and set them with one of the points uppermost. Then, the table cut emerged when Diamond cutters started to create a “flat top” by grinding down the upper point. The French Cut was the next logical progression, in which four more corner facets were added to the crown area. The progressive experimentation period, which lasted approximately three Centuries, was a long and complicated journey towards finally achieving the French Cuts that we are familiar with today. French Cuts came in a wide variety of faceting combinations, but only a few survived the test of time. The French Cut was also popular in the 1920’s, and so, given the most unusual lack of visible references from older literature, it seems likely that the name “The French Cut” was a 20th-Century creation. If this is the case, the French Cut seems to have evolved from a need for a simple and attractive cutting style for smaller stones. The hallmark of the French Cut is that it is easy to create but produces a play of light that can be spectacular. Further experimentations on the Table Cut led to the origins of the Step and Scissor Cuts designs, which eventually transformed into what we today call the standard 57/58 facet Brilliant Cut design. The French Cut facet design was not only used for Diamonds, but also for Sapphires, Rubies, Emeralds, and even other semi-precious gemstones. As it is a relatively simple cut with a small number of facets, it is also often used for smaller accent stones flanking the main Gems. The French Cut was wildly popular in the Art Deco period of the early 20th-Century. They can be prominently found in jewelry literature of the time, in which readers can see watches set with French Cut colored Gems & Diamonds accenting their bracelets and bezels. It can also be found in a more simple application – On jewels when designers preferred a livelier appearance than what was offered by the Step Cut and Carré Cut. A reason that French Cuts were popular in the Art Deco era was their ability to complement the geometric designs that popularized the period. In modern times, French Cuts are most often found in antique jewels, precious gems, and particularly in small stones where the simplicity of the cut remains a strong asset. Surviving Art Deco jewels are said to be the best display of these treasures. However, finding jewels set with French Cut Diamonds remains a rare event. When such an event occurs, the marginally variable faceting highlights the fact that there was no standard for these cuts. Personally, I have seen pieces from prominent jewelers that feature a mix of French Cut facet designs that actually add a great deal of character to the overall beauty of the piece. 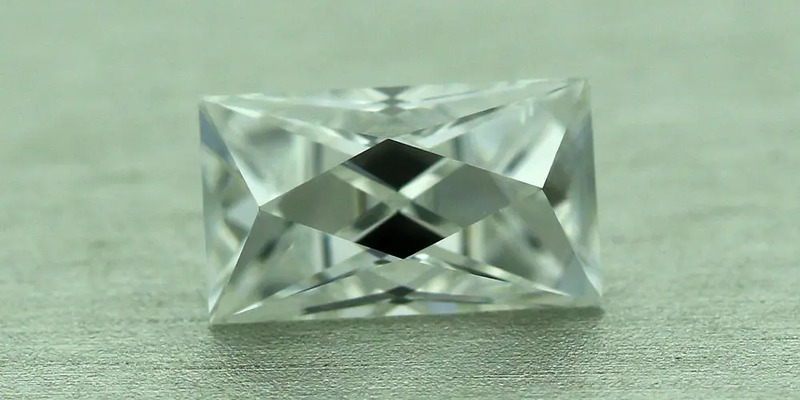 The most immediately noticeable feature of the French Cut is that the crown appears square when viewed from above, and consists of just nine crown facets, with the square (or rhombus-shaped) table facet positioned diagonally to the square shape of the crown. Adjoining the four main crown facets are four triangular facets that point towards the corners of its square shape. This creates the optical appearance of a four-pointed star, which you can see in the images below. For these Diamonds, the position of the crown should be high and incorporate a small table facet. Some French Cut Diamonds feature an octagonally shaped table that is created when the four triangular crown corner facets are split further. When implemented you get more reflections and a deeply sophisticated play of light. In my experience, I’ve noticed that this approach was more common among high-end jewelers of the era. In terms of present design potential, modern technology and techniques enable French Cuts that have multiple geometric shapes. Creativity and freedom are on full display in today’s unique French Cuts. Today, we are also able to modify certain features of French Cut Diamonds to allow for more complicated setting techniques. An example of this would be the mystery setting, which was mainly applied on softer colored Gem materials in the Art Deco era. Today most French Cut Diamonds found in the market are from either the recycled market or from Diamond cutters that manufacture on a per order basis. However, new French Cut Diamonds are re-cuts from polished Baguette, Carré, and sometimes Princess Cut Diamonds. Structurally, these new Diamonds are completely different to the origins of the cut. Let’s take a look at the three main types of French Cut Diamonds. In the aftermath of the Great Recession, huge quantities of Gems from recycled jewels re-entered the markets. These Gems brought with them a new supply channel for the industry, albeit one that was a decidedly a mixed bag that included some Period Cut Diamonds but mostly all generic shapes and cuts. Within these mixed bags you would be lucky if you found a small number of French Cut Diamonds, but their rarity meant they could not be relied upon for fresh new designs. The next type of French Cut Diamonds comes from polished Baguettes, Carre’s and Princess cuts. They are cut from existing modern polished proportions, which are not ideally suited to produce the French Cut’s special, optical play of light. They usually possess shallow upper crown facets combined with deep pavilion depth derived from their modern cut proportions. 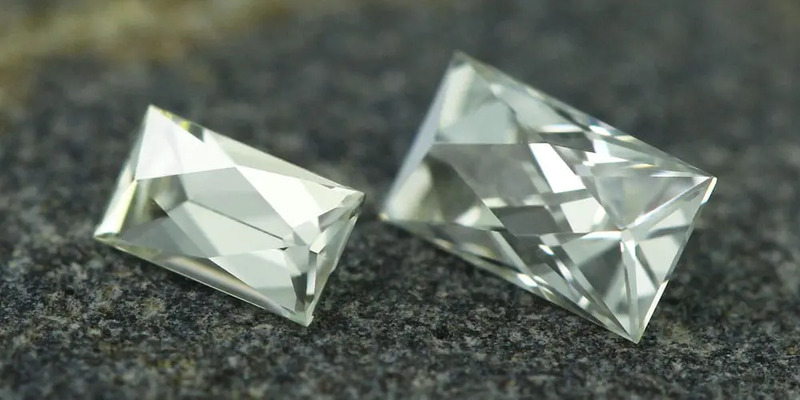 At GemConcepts we respect the historical, three-dimensional proportions of the French Cut Diamond while applying our own original faceting designs. French Cut Diamonds must be cut to the correct proportions of high crown heights coupled with correctly-applied pavilion facets, angles, and depth. It’s important to note that one of the most crucial elements are their inverted corner pavilion facets. The high crowns display what we call the “sculptor effect,” a 3D visual that makes each and every French Cut pop while allowing additional play of light caused by its crown/table surface reflections. French cut Diamonds commonly possess between 18 to 24 facets in total. Because of the low count facet design, if the proportions are not correctly applied then they will appear dull and watery. This effect will only worsen with time as dirt accumulates on the pavilion. Today, most French Cut Diamonds are from either the recycled market or from Diamond cutters that manufacture on a per order basis. However, as mentioned above, new French Cut Diamonds today are mostly re-cuts from polished Baguette/Princess Cut Diamonds, which are completely different from the origins of the cut. 1. Restoration of antique jewels. 2. Creating contemporary jewelry which designers can use a unique alternative to generic Diamond Cut solutions currently available. Designers can elevate their unique designs while considering new & creative appearances for their Diamond visuals. When designing with pre-owned French Cut Diamonds, there are limits to what can be found on the market. When working with newly cut French Cut Baguettes, there are limitations to what can be achieved with respect to look, feel, and character. 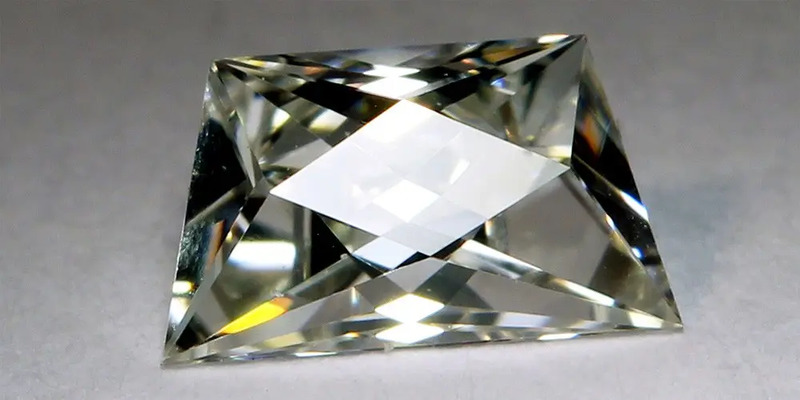 For these reasons, when cutting French Cuts to their original proportions, faceting and visuals, material weight-loss become secondary to the achievement of its unique optical beauty. This does make them more expensive than the counterparts mentioned above, but well worth it. French Cut Diamonds offer a unique look that is currently missing. 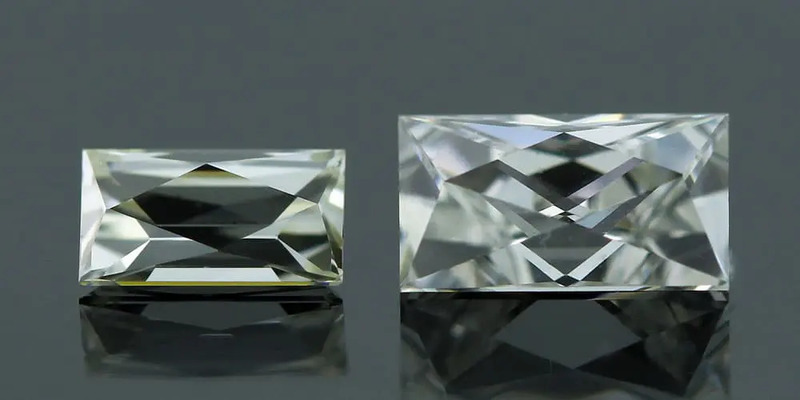 Generic cuts offer either highly reflective square (modified brilliant) Princess Cuts or the more subtle elongated reflections derived from the square Step Cut. French Cut Diamonds offer the missing in-between – a beautiful array of medium-to-large blocky (chunky) type light-return, which greatly depends on the facet configuration of the crown. The version with the rhombus shaped table will deliver larger flashing events and are favorable for smaller Diamonds, while the octagonal-shaped table will offer medium-to-large flashing events due to the splitting and doubling of the corner crown facets. Present designs featuring French Cut Diamonds are as small accent or side stones to crown a center piece, and dangling jewels because their 3D sculpture effect delivers visual splendor in all directions. When set as bundles they create a visual that is absent in generic cuts. Due to the nature of their popping crown heights, they provide an illusion that resembles small ice cubes set in jewels. The best part is the fact that their geometric shapes are adaptable enough to fit even the most complicated of designs.